Nut butter lovers, rejoice! 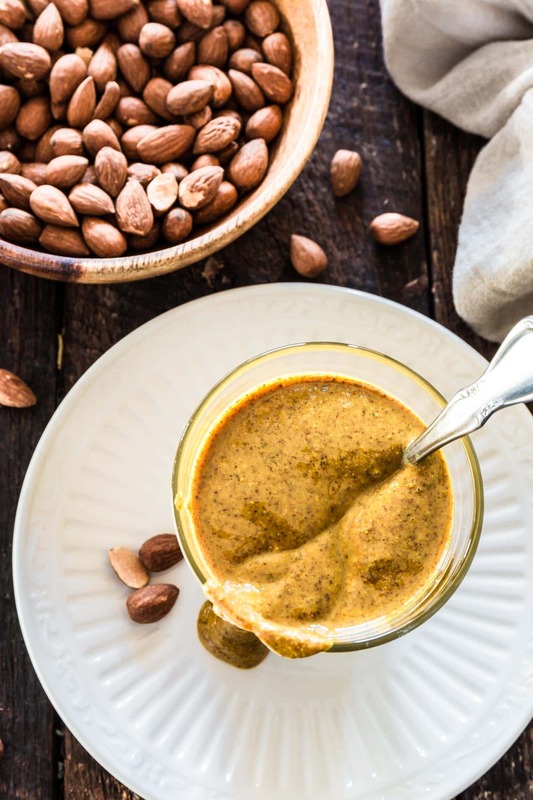 This almond butter mixed with turmeric is everything you’re looking for: creamy, salty and good for you, loaded with health benefits from both the almonds and the turmeric. February is not only the love month, but also American Heart Month, which is why I’m ditching the chocolate and focusing on a recipe that is heartilicious. Aaaand, I just realized I’m making the same type of lame jokes my dad does. I guess that’s a trait that comes with age? ??? Oh well! Nothing to do but embrace it, I guess! But anyways…back to the “good for your heart” subject. Both the almonds and the turmeric are believed to generate incredible overall heart benefits. They contain antioxidant properties responsible to destroy the free radicals related to stress and heart disease. Add to that turmeric’s anti-cancer and anti-inflammatory benefits and almonds being an amazing source of protein and fiber, and you are looking at the epitome of a super food. Now, I’m no scientist or nutritionist. So I won’t get into further (ahem, kinda boring) details. You can do your own research if that’s important to you. For me, what matters is that I’m feeding my body with something not only healthy but also delicious. And this Turmeric Almond Butter is just that! You will notice I’ve been on a healthy recipe phase lately. Don’t worry! I will not become a healthy blogger and all the indulgent comfort food that you guys love (and come here for) is still going to be my main focus, but since I’m trying to eat better, I figure I might as well share a bit of that journey here on the blog as well. At the end of 2016, Tim and I noticed we were beyond stressed. We would worry ourselves sick over every little insignificant thing and we eventually realized that is not how we want to live our lives. So we’ve been trying to make some changes, and how we eat is a big part of it. Nothing like “lose 100 pounds in one year”. No, nothing like that! Just small little changes, like sitting down to eat as a family, eating earlier at night and trying to be more conscious regarding what we feed our bodies. Not to say we are thriving at that, but we are certainly trying our best. However, I am not one to deprive myself of the things that I love. So my fridge still has a pack or two of my favorite European style butter, which I try to eat on weekends only, over a slice of sourdough bread or a croissant. For weekdays, whole wheat toast with some sort of nut butter is what have been giving me the energy I need. I try to make a different type each week. Sweet, savory, chocolate-y, it’s all fair game because my goal is not to blindly cut down calories, but to eat food that is packed with good nutrients. And then, when it was almond butter week, I decided to add a little bit of turmeric. Because, ya know, turmeric is the spice of the moment and I wanted to get on that wagon. The results are a nut butter that is slightly bitter, aromatic and with scents of orange and ginger. The flavor is really subtle, especially because I only add a teaspoon for every 2 cups of almonds. However, feel free to go as crazy as you want! The more turmeric you add, the yellower the almond butter will be. And without any further ado, I give you Turmeric Almond Butter! Transfer the Turmeric Almond Butter to a glass container and allow it to cool fully before storing it in the fridge.